Well done to Greenpeace activists who climbed the side of Prirazlomnaya, a floating oil platform in Russia’s Pechora Sea, on Friday to protest about oil drilling in the Arctic. 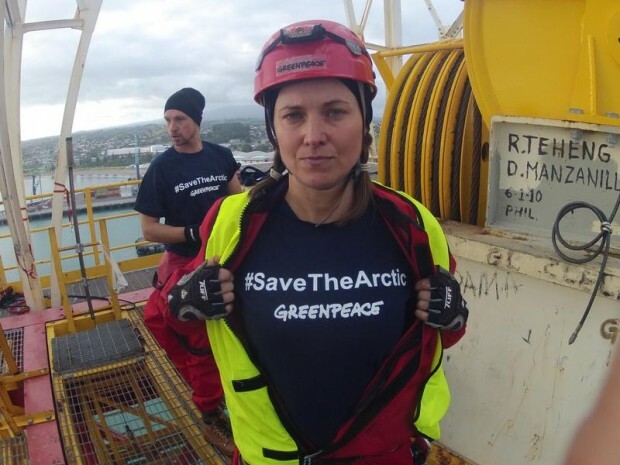 The six activists, who included Greenpeace executive director Kumi Naidoo, spent several hours hanging off the side of the giant oil platform, interrupting its operations. A report by Greenpeace and World Wildlife Fund, issued last week, said that a spill from the oil platform could contaminate protected areas and nature reserves on the shore and islands within 20 hours, while emergency teams would take at least three days to reach the area. This entry was posted in Arctic drilling and tagged animal welfare, Arctic, climate change, Environment, nature, wildlife. Bookmark the permalink. This is fantastic. I was actually living in Wellington, New Zealand when Lucy Lawless was arrested. The whole country was behind her. It was fantastic. Thanks for visiting my blog. Yes, it was a fantastic protest by Greenpeace. It must have been great to be in Wellington at that time and see at first hand how much support there was for Lucy. Thanks for visiting Jim and liking the post. Just had a look at your blog, there’s some great photos on it.